Location and price were the best qualities for me. All the locations I wanted to go to were within a 30 minute walk from the hostel. The staff were very friendly and helpful as well. I stayed at the Republic Garden in November so off season the atmosphere wasn't the best but otherwise it was perfect, great location, very clean! Didn't respond to emails, need to add directions to description. 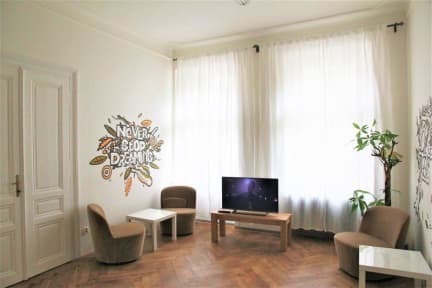 Staff is helpful and location is great - walk to many vegan/vegetarian restaurants (Loving Hut, Govindas), old town square, Charles Bridge, Main Train Station and Florence Bus station, etc. Good breakfast with fruits. Facilities good but water leakage makes bathroom floors wet. Easy to interact with other travelers. I am a little disappointed in my stay at The Republic Garden after reading all of the good reviews. I arrived in Prague around noon. I had the most difficult time finding the hostel. There was only this little tiny sign in the window. When I finally arrived, I could not leave my stuff there b/c it was outside check-in time and there was no staff on hand. I have never been to a hostel or hotel that does not let you leave your stuff there before check-in time. Don't recommend. Won't go back.